A twist on the classic whiskey sour. 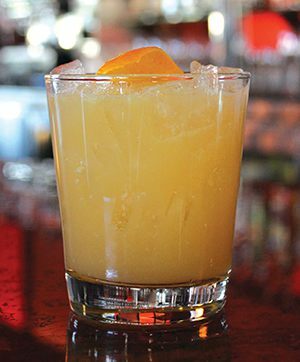 Our version uses Woodford Reserve Bourbon, Cointreau, fresh lemon, hand-squeezed orange juice and clover honey water. Fill a bucket glass with ice and set aside. Fill a mixing glass 2/3 full of ice and add all ingredients. Cap and shake vigorously for 10 seconds. Strain into serving glass. Garnish with orange peel dropped in (unspeared).